For over 70 years, Hewlett-Packard has offered solutions to people, businesses, and communities around the World, in an effort to transform lives with the use of technology. Did you know that Hewlett Packard sells over 1 million HP printers per week, 48 million HP computers annually and that one out of every three servers shipped worldwide is from HP? Did you know that HP software makes calls possible for more than 100 million mobile phone users and that Hewlett Packard has helped over 50 million people store and share over 4 billion photos online? Very impressive. Hewlett Packard is divided into three main business groups. The Personal Systems Group supports business and consumer HP computers and PCs, mobile computing devices and workstations. The Imaging and Printing Group offers Hewlett Packard printers, inkjet, LaserJet and commercial printing, printing supplies, digital photography and entertainment and the Technology Solutions Group supports business products including storage and servers, EDS, managed services and software. It's a safe bet that you've used an HP product at home or in your office. ReStockIt.com offers a vast selection of Hewlett Packard printers, HP laptops and HP computers and accessories at unbeatable prices every day! Get the best technology for your home and office needs at ReStockIt.com. We offer brand name office technology you love and trust. 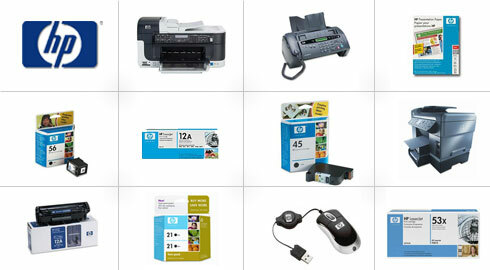 Hundreds of Hewlett Packard printers, HP computers and HP laptops can be found at ReStockIt.com, as well as the best priced ink and toner for all of your Hewlett Packard inkjet and laser jet printer needs. Browse our selection and find the lowest prices - guaranteed!